The Breaking the Bones of Hell SoundPack from Syrinscape is a complete audio solution when playing through the final chapter of the Hell's Rebels Adventure Path. 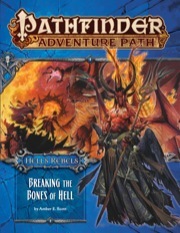 "Breaking the Bones of Hell" is sanctioned for use in Pathfinder Society Organized Play. The rules for running this Adventure Path and Chronicle sheet are available as a free download (723 kb zip/PDF). Guys just go and play it . Best final boss fight ever . This book is by far the worst of the six and probably the worst adventure path/module I have run. It starts out with a peace summit which will be interesting to maybe one of your players and then gives you some boring and non-challenging filler to get them to higher levels. At the begging of the book it promises that you will go to epic places and do epic things … but you really don’t get to do either (see spoiler for details). It is worth noting that this book has a content warning early on for some truly dark and terrifying content, but none of that dark or terrifying content was necessary for telling the story and just distracts from the actual plot. The most unforgivable thing is that after six books it leaves you with the emotionally unsatisfying sense that your characters didn’t really accomplish anything (again see spoiler for details). Avoid running this book! The book promises that you will go to the darklands and hell … but “the darklands” is just a typical undead dungeon at the bottom of a very long pit (which just as easily could have been on the surface) and the only part of hell you can go to is the dungeon that Mephistopheles lets you go to. Worse, that dungeon is filled with souls that are being tortured in unique and horrifying ways, but punishes you for trying to help them (which is bound to be a problem in an adventure path designed for chaotic good PCs). It also punishes you if you try to be clever and bypass any part of the dungeon. Large portions of this final dungeon are just devoted to giving you the back story of the antagonist that you have been fighting for six books … but doesn’t make you want to make you fight him anymore than you previously wanted to (it might actually make you want to fight him less). Worse of all it turns out that the entire adventure path that you ran to oppose evil and Cheliax was actually something that Mephistopheles wanted to happen and you have advanced the cause of hell and Cheliax. … just the worst. PS. I know this is just a minor pet peeve of mine, but the writer claims that Azata don't have genders when we have seen LOTs of evidence to the contrary in other material. If he wanted a genderless race ... why not just make his own new race?! *DISCLAIMER*: This is a single review for all adventures in this AP. Hell’s Rebels is the best Paizo Adventure Path. Of all the AP, it is the one that’s most coherent, approachable and GM-friendly. This review applies to all 6 books because their quality and style are so consistent that you don’t even notice the fact that they were written by 6 different authors. 1. It has a clear, believable and complex plot which goes from point A to point B to point C while at the same time allowing for multitude of side treks, optional quests and player-driven initiatives. 2. It goes full on Golarion. It touches upon core themes of the setting and is heavily nested in its history. It provides the much-anticipated opportunity to punch one of the biggest evils of the setting in the face. One warning: you can’t just lift HR and drop it into other settings without massive amounts of work. 3. The BBEG is front and center, introduced in adventure 1, encountered and fought against several times across the campaign. He’s evil, callous, quirky, nasty, brutal, amoral and good at being bad. He’s right up there with Ileosa from CotCT. 4. The campaign starts in one city and mostly stays there, with some small side-treks and one bigger detour which, fortunately, is also urban. 5. There is a cadre of sympathetic, recurring allied NPCs to play second fiddles to the PCs. There are also enemies whom you can interact in ways other than roll for initiative. The RP opportunities are plenty. 6. The cast of both allies and opponents is diverse in every sense of that word. 7. The players get opportunity to discover some of the setting’s secrets and, to a limited yet satisfying degree, reshape it without causing a Realm-Shattering Event. 8. The ending is epic to the core and fitting for a campaign of this scale and magnitude. 9. Episode 4 is a special issue with extra page count, longer adventure, more support material, an excellent article on Aroden and much, much more! 10. I love the blue colour theme for this AP AND Wayne Reynolds did the cover art. Double victory! I haven't run Breaking the Bones of Hell yet, so this review is largely based on my impressions from reading through the adventure. Breaking the Bones solidifies the Hell's Rebels AP as the most consistently high quality AP to date. While bringing everything the campaign has been building up to to a close, this leg provides a good mix of the elements that have come before: a mix of role playing and combat, a little investigation, and an epic climax to finish things off. Overall assessment: A good mix of fun role-playing opportunities and combat, ending in an en epic encounter with a mythic Barzillai atop the Tower of Bone. A satisfying conclusion to this AP, up there with the very best AP 6th legs (like From Hell's Heart and The Divinity Drive). 5 stars. This one is... a pretty big deal. The word "Epic" is criminally overused these days, but rest assured: Breaking the Bones of Hell is epic. You will not only delve into the psyche of your adversary in a very real and immediate sense, you will do it in the very bowels of Hell itself. Note that this will not be for everyone as written- some of what you learn about the enemy might be a bit R-rated for some groups. Even more than usual, I would suggest a GM using this adventure read over the relevant sections very carefully, keeping their players in mind, and possibly making some edits. But rest assured, done right, your group will feel like absolute aces for coming out on top. This right here is how you and an AP with a BANG. If they don't mention Faust in the Mephistopheles article I will be disappointed. A trip to Hell! YES!!! So, what you are saying is that a rebellion with a rose theme overthroes and kills an powerful lawful evil ruler, who then becomes even more powerful and hellish after he dies? I think I am familiar with this story (not that that is a problem). Agree, awesome title. And I am all behind getting some digs on Mephistopheles! Wow, two female writers in one AP. I like that. Great, I have now the mental image of miniaturised Crystal and Amber desperately trying to bookend my Pathfinder AP shelf. THANKS FEROS! Must have missed this one when it was announced Friday. Anyone want to guess what reconstituted form Barzillai takes in this? The easiest answer is that he was killed by the party, went to Hell, and became a devil. But I thought Pharasma's judgement process lasted a really long time and unless you're very, VERY successful in serving Asmodeus you most likely spend thousands of years as a lemure. I wonder what's going on with him? I'm guessing divine intervention on Asmodeus' part - losing yet another chunk of Cheliax diminishes his impact on the Inner Sea isn't something he'd care for. Maybe he signed a contract. Time will tell. I think I am going to include Cardinal Adrastus Thorn from Way of the Wicked as a bonus boss here. I'm not sure what context the PCs would encounter him since I don't know the finer points of this volumes' plot, but maybe he has business in Hell when the PCs bump into him. The ritual he went through to become the genius loci bypasses the judgment of Pharasma - that's partially where Mahathallah's soul anchor comes in. Mephistopheles told him that if he died before the ritual was complete, he would have to spend his remaining years of life in Hell's torments before becoming the genius loci. Genius loci...location spirit? Of Kintargo? Why would he want to do that? Not just Kintargo, but all of Cheliax. He wants to become the land itself, immortal and eternal, and to use the people of Cheliax as minions for his pleasure and entertainment. He comes off as weird and "creepy", even to his family... and they don't know the half of it. Is this an infernal pact between Barzillai Thrune and Mephistopheles / Mahathallah or is Asmodeus in on this deal as well? ...is with Mephistopheles. He's not really involved with Mahathallah at all, but he IS kinda doing an end-run a little bit around Asmodeus. Part 5 will have more rules about infernal contracts and how they work. As for why he wants to become a genius loci... well, not only is it a path to immortality, but it's also a pretty powerful entity in and of itself. Full details on them will be in the "Continuing the Campaign" article in this volume, in a "What if the PCs lose?" sort of scenario. ...Then the PCs of Hell's Vengeance fail, too? It seems like Cheliax getting turned into a sadistic genuis loci like the space ship from Event Horizon would be something that would lead to Abrogail and her villainous agents suffering a horrendous fate. I think Asmodeus is gonna be pretty damn pissed off when he finds out that the Lord of the Eighth ruined his plans for Cheliax to such an utterly perverse extent (if Asmodeus doesn't know already). Hell's Rebels is pretty tightly focused on the region of Ravounel and the city of Kintargo. Barzillai may wish to become all of Cheliax... but he starts relatively small. If the PCs fail in Hell's Rebels, in other words, then the PCs of Hell's Vengeance going in to use what we'll talk about in the "Continuing the Campaign" for Hell's Rebels on how Barzillai as a genius loci works in order to defeat him or keep him from spreading further into Cheliax would work fine. But it's not a case of "All Cheliax falls if Hell's Rebels is a PC fail." Either way, it could be really interesting if the players failed to stop the ritual, and had to form an unholy alliance with the Hells vengeance Pcs in order to stop the evil loci Barzillai from sinking all of Cheliax. Granted it makes the whole 'break away from the evil empire' thing a bit tricker but at least you put the lunatic down. Yeah, my first thought was "Holy balls, is that Mephistopheles?" And it looks like they're fighting a pit fiend in the actual cover spread. Whether or not they get in a fight with a certain pit fiend is up to them! What form does Barzillai Thrune take in the final battle? I.E what has he become of him since he went to Hell? If someone who has this could give a breakdown of the monsters in the bestiary, that would be awesome. He's a Bone Devil Inquisitor 16, perhaps with 2 Tiers of Hierophant if the PCs aren't diligent in weakening his supporters. Cruciarus, CR 12 undead. Undead that only arise from the cruelest of tortures. Pain touch and tortured gaze attacks, with different types of gaze effects depending on just how they were tortured in life. The Forsaken Legion, CR 2-4 undead remnants of a force of Jistkan soldiers subjected to a spell that rendered them without need of food or sleep, but also apparently doomed them to eternal service as well. Arbalester, Defender, and Foot Soldier versions. Shadow Golem, CR 14. Str damage breath weapon, interactions with light and shadow magics, and a shadow aura. Has to be made on the Plane of Shadow from materials native only to that plane, including blood of its sentient beings. Nightprowler Nightshade, CR 10. The smallest Nightshade, looking something like a red-eyed feline of pure shadow. Their natural attacks leave a stain of creeping dark shadows that hinders magical healing and vision. What is the general flow of the plot in this volume? Like, what are the three or four acts? And how do the PCs get sent to Hell, just plane shifting? I think it's really funny that Barzillai goes from being impersonated by a bone devil to becoming one. I extend a big thumbs-up on the design of the Infernal Contracts. They use the library research system elements in an interesting and effective way, include a rule to prevent brute-forcing-via-infinite-retries by the underqualified-to-understand-them that reflects diabolic trickery well while allowing bargainers to still have a chance of cracking them later when they're more up-to-the-task, have a good selection of benefits, and are overall rather flavorful with the hidden clauses, payments, and effects. I'd love to see a 'fiendish toolbox' book full of these and manifestations (and probably other, similar, things). Could I get a little more detail on the new Nightshade? If it is possible, i would like to know how the article about Mephistopheles faith is treated, and if are given stats for the archdevil or an herald of sorts. I am REALLY excited to see another one of these! They are one of the many reasons I bought Bestiary 2. Sadly no write-up for Mephistopheles stats, but otherwise a great module. I'm looking forward to GM'ing this AP one day. That was a specific decision on our part—the AP isn't about fighting him, after all, and while he DOES have stats and is likely CR 30, putting stats in the book sends the exact wrong message for this AP. So... no stats. There is indeed at least one Faust reference in 102 though. I made sure of that. Well GMs can just update and upgrade the Mephistopheles from 3.5 for a home game. Done. Who shows up in stat form in ways to continue the campaign? Whoops, looks like I posted here about the contracts earlier instead of on The Kintargo Contract. The stats are for Azrana, a Morrigna Psychopomp Cleric of Pharasma who is likely to be helping PCs who are out to destroy the Soul Anchor. Alternately, she's opposition if the PCs are trying to use it for their own purposes. There's also traits / powers for Barzillai as a Genius Loci if the PCs don't stop him from becoming one. Those aren't really a normal statblock, but I think they count as something worth mentioning here. Revoke Healing (Su) A number of times per day equal to your Charisma modifier (minimum 1), you can deal damage to a creature in your line of sight that you have magically healed within the past 24 hours. The damage equals the amount restored by the highest-level spell with the healing descriptor that you can cast. This may result in you causing more damage than you healed. The damage occurs in a single round. In the case of healing spells that heal over multiple rounds, only healing provided in the first round is counted when determining damage. It never says that they had to be willing to be healed. Slap an enemy with cure light wounds - maybe quickened or reach or something. Even if they make a save, they've still been magically healed. Then, hit them for damage equal to your highest-level healing spell (probably heal), with no save. It doesn't even carry the part of heal/harm that leaves them with 1 hp. Fascinatingly, it gets way less powerful when you get access to mass cure serious wounds. That's what you get for trusting in Mephistopheles, I guess. If you hold out, though, your faith will be rewarded with mass heal's damage. Still... I might have to use this someday. Anything involving helping the Glorious Reclamation? Or anything linking to Hell's Vengeance, for that matter? Nope. Just a brief mention (in either this one or the last) that they're in Westcrown by now. And the thing about making them and the HV PCs fight, but that's not news. No doubt getting Shadowbeasts all up their buisness. Oooh, hints for a character possibly appearing in a future AP, intriguing.